The Speck Blog: How does Speck stack up against Foobot, Aware, Dylos and other air quality monitors on the market? How does Speck stack up against Foobot, Aware, Dylos and other air quality monitors on the market? One year ago at SxSW, the Carnegie Mellon University CREATE Lab promised to collect air quality sensors and test them, openly publishing all data. To help families and air quality advocates make better, more informed choices, the CREATE Lab took a closer look at several sensors on the market. Monitors tested include: Air Quality Egg, Awair, BlueAir Aware, Dylos DC1100 Pro, Foobot and Speck. The report also studied the process of downloading data from each device and time-stamping it correctly - which was not at all easy in some cases. Several different air quality sensors on the market were tested against a Grimm EDM 180, an EPA-approved class III instrument. A particle generation system was used to expose each sensor to the same environment, at the same time. Researchers then studied the results of each sensor on three different scales: two-day views showing all the data for 80 hours; one-day views showing 11 hours; and one-peak views showing one 1.5 hour peak. 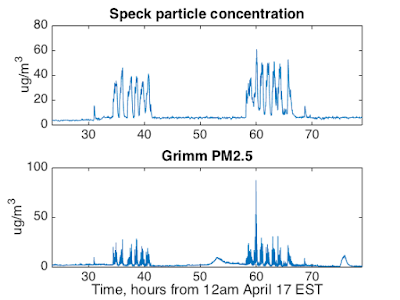 The graph below shows how well Speck correlates to the Grimm (it was able to pick up on bad air quality)! For an in-depth explanation of these Speck results and more, please see CMU CREATE Lab's website: https://explorables.cmucreatelab.org/explorables/air-quality-monitor-tests/#speck. The full results are published here: https://explorables.cmucreatelab.org/explorables/air-quality-monitor-tests/#introduction. Watch Airviz CEO, Illah Nourbakhsh, speak on air quality and community empowerment: https://www.specksensor.com/learn/empowerment. To learn more about Speck or to purchase one, please visit our website: www.specksensor.com.